I've spent most of yesterday trying to track down some of the various problems afflicting the simulation system to little avail (as mentioned in an earlier post). What is becoming apparent is that navigating (and trying to understand) Bullet's API is becoming quite an exercise in itself at times. Through this process, I'm really starting to appreciate the extent that C++ can be used to obfuscate the meaning of or the ability to easily find code to understand it. Furthermore, I still don't think that doxygen/javadoc-like tools are totally up to the task of improving this situation a lot of the time, but serve to introduce their own layers of complexity into the situation (* details to come in a future post when I get around to it). I've started working on and committing the new C-API for interfacing with Bullet into my branch at last. At the time of writing, I've finally replaced the old API calls with the ones from the new API. Everything that worked before seems to work still. Also, all the hack to force resetting of simulations now seems to be working, while it didn't before. Yay! (Note: it's still really a hack still, since we should be able to do this by just stopping playback, or jumping back to the 'start frame' for the sim... but at least that should be easy to fix soon). Unfortunately, despite now using MotionStates, I still can't seem to get reverse playback working (which is necessary for allowing normal 'scrubbing' of the timeline). There is some movement in the right direction, but it only happens once and then stops. This was not the case when I tried doing this in the "Hello World" demo in Bullet srcs. Is it to do with the sizes of the timesteps - i.e. do I need to specify max timesteps/substeps? Or am I screwing up the way the MotionStates update? Just a quick note here that I'm currently busily hacking away on the next piece of core architecture necessary to get the Bullet integration more functional. While I haven't been able to work on this much this week, this should be ready in the next few days. Anyways, enough talk for now, and more code... over and out. This week has been busily spent sitting exams (over halfway there now), studying for exams, and occasionally a short spot of coding. Oh, and I finally got back my HCI Assignment - an essay evaluating the "Ribbon" GUI in MsWord - for which I got 100% for! Yeeeehaaarr! 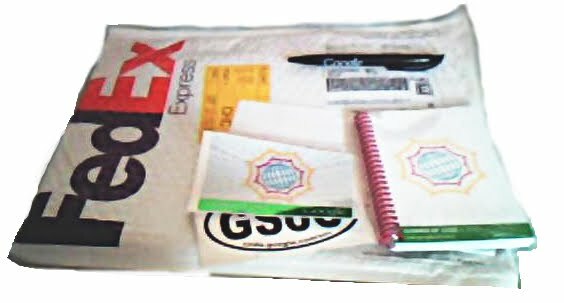 Today I've finally received my GSoC Welcome Package at last! Quicky snapshot of contents from laptop webcam for convenience, with minor PP to look less crappy. Recently I was sifting through some photos on my computer, and finally decided to upload some of the better shots for the world to see. Artifact 3 - Animation system controlled moving object affecting physics object. Not quite as impressive as I hoped it to be due to blotched settings, but it gives an idea. Just thought I'd make a little note here about the current status, since I said I'd have an initial prototype "working" by about now ("+/- 1 day"). All the basic components of what I consider necessary to be able to set up a basic sim (as in single cube falling onto a plane, which is as basic as it gets) at least now are now in place! AND it compiles and Blender still starts/works without major issues in general. As is often to be expected, I ran into a crash trying to set up a sim for the first time. What's the problem then? Over recent years, I've found myself often pondering over the ways in which subjects (or las materias) are taught or presented. Why is it that some lecturers can make a subject interesting and above all guide true understanding and insight, while others can make even potentially interesting subjects dull tedium? Though this may not hold for everyone, I'm starting to believe that presentation style has a lot to do with the effectiveness of teaching and learning. Having performed merges on branches a few times (during last year's SoC, and also an earlier branch - "branches/animsys2") has not left me with a very favorable impression of this method of version control (in SVN at least. I'm not sure how well some of the distributed systems cope with this in practice, but perhaps it might be a bit better). In my experience, performing a branch merge using TortoiseSVN + the Blender SVN server is a very dog-slow procedure. It takes upwards of 3 hours a pop, and often with no guarantees of success (either from choosing the wrong revisions, or connection failure halfway when computer goes on standby or otherwise). In contrast, simply updating from trunk or a branch and then saving out patches, gives nice 30 sec to 1 min updates to keep your sources up to date. 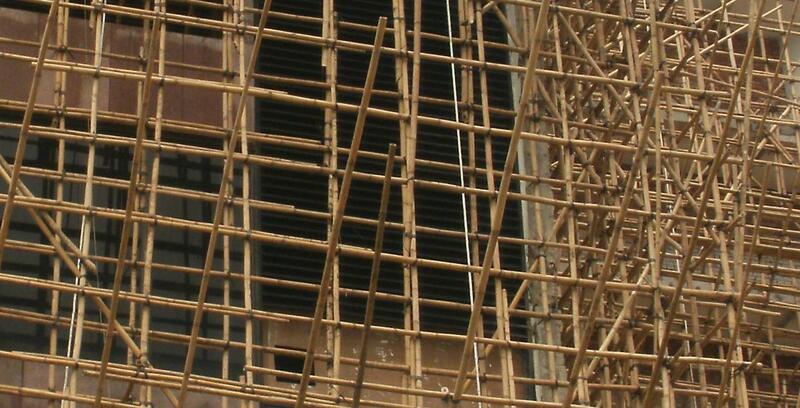 Photo: complex scaffolding at a building site in Hong Kong (near the "Avenue of Stars"). 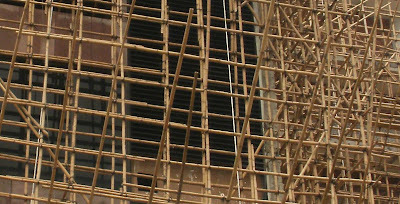 Crop of photo taken during vacations there in April this year. Firstly, these documents are still subject to change, as additional requirements are added/removed, and/or issues with the design rectified. Anyways, here we go... enjoy! This year I'll be be working on implementing a "simple and natural" (to take a page from Jacob Nielsen's Usability Heuristics) integration of the Bullet Physics Engine into Blender; a "Bullet Construction Toolkit". Some may know that Blender already has partial integration of Bullet, but this is restricted to being another one of the half-baked and clunky Game Engine features. Currently, when I'm not busy finishing off assignments (so much for doing a "Summer" of Code in "Winter") I've been working on getting a nice design for this sorted. More news on that later.